Battery life is great, but the Razr HD really does seem underpowered for what you're paying, and while the specs might not seem terrible now, the relative weakness of them is going to make it become a lot more dated a lot faster than most similarly priced phones. 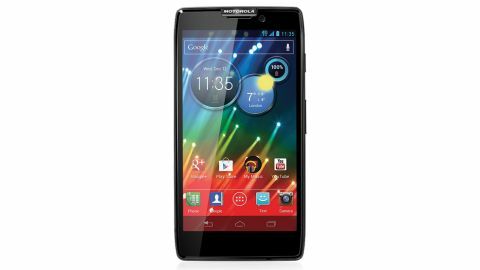 The Motorola Razr HD launched in the US late last year, but in that time all that's changed is the name (it was called the Motorola Droid Razr HD in the US), so it's less of a mouthful now. Unfortunately the specs haven't changed, leaving it with just a dual-core 1.5GHz processor and 1GB of RAM. Rounding out the specs, the phone's running Android 4.1.2 Jelly Bean, there's a 4.7-inch 720 x 1280 display, 16GB of internal storage - which can be expanded with a microSD card of up to 32GB - and an 8MP camera capable of shooting 1080p video at 30fps. While those specs would be fine on a mid-range phone, for a flagship handset they were looking a little low-end even last year, and now next to the Sony Xperia Z and Samsung Galaxy S4 they seem positively quaint. Being a flagship handset, it's not unreasonable to consider these phones its competitors, despite them rocking at least quad-core processors and 2GB of RAM. Of course specs aren't everything and they don't always equate to real world performance anyway, but it's still a little disappointing. On the other hand the price is a little lower than some top-end handsets, coming in at around £400 (Australian prices TBC) SIM-free, cheaper than an iPhone 5 or Sony Xperia Z. It's priced at around the same level as the high-end-but-last-year's Samsung Galaxy S3 - but even that substantially outperforms it on paper. Ditto the Google Nexus 4, which can be picked up from Google itself for just £239/AU$349 upwards. One thing that we will say is that the Motorola Razr HD certainly looks the part. With a rugged yet premium-looking Kevlar back plate, it comes across as both expensive and built to last. It's also a nice change from the plastic found on most phones, or even the glass or shiny metal that a handful sport. The corners are also a bit different, being less rounded than most of the competition, giving it a striking, almost jagged look. The front of the phone doesn't disappoint either - sure it's basically just a sheet of glass, but it's edge-to-edge, leaving it looking pretty slick. At 146g it's got a pleasing amount of weight to it, which feels particularly appropriate given the slightly rugged design. Size wise it's about what you'd expect for a top-end phone, with a 4.7-inch display and total dimensions of 131.9 x 67.9 x 8.4mm. If anything it's actually quite a slim handset, though still somewhat thicker than the incredibly slender 7.9mm deep Sony Xperia Z. While it doesn't feel bad in the hand, it doesn't feel great either. The Motorola Razr HD's Kevlar back has quite a pleasant feel but it's also quite slippery, making it slightly harder to get a solid grip on than many other phones. The corners also present a slight problem, since being more jagged than most they can be a little uncomfortable, potentially digging into your hand slightly when the handset is held in certain positions. Pretty much the only thing on the front of the phone is the 4.7-inch 720 x 1280 screen with a 312ppi pixel density. That's quite sharp, just topping the 306ppi Samsung Galaxy S3 and almost matching the 318ppi Google Nexus 4, though not even coming close to the 441ppi Sony Xperia Z or 468ppi HTC One. The only other things on the front of the phone are small black strips at the top and bottom. The bottom strip is devoid of any features, while the top strip has the earpiece in the centre, with an indicator light above it, which flashes when an email, text or voicemail comes through. There's a small Motorola logo at the very top, and the 1.3MP front-facing camera lens just to the right of it. The Kevlar back is adorned with an arrow-like pattern, with an 'M' in the centre. The main 8MP camera (which can also shoot 1080p video at 30fps) is at the top, while to the left of it there's the flash and to the right there's a speaker. The edges of the Motorola Razr HD have a brushed metal look to them, with the top edge housing a 3.5mm headphone port on the right. The right edge is home to the only two buttons on the phone - a power button near the top (which is also used to make the handset sleep/wake up), and a volume rocker halfway down. The positioning of the buttons is fairly standard and works well. Usefully they also feel different, since the power button has little ridges running along it, while the volume rocker is mostly smooth but juts out a little at each end. This makes it easy to differentiate the buttons by touch alone. The left-hand side has a micro HDMI port at the bottom, for connecting the handset to a TV or monitor, a micro USB port above it and a little compartment halfway up, which houses the microSIM card and a microSD card. The back plate can't be removed, so there's no option to swap the battery. However it comes with a 2530mAH battery, which is pretty big for a phone of this size. It promises impressive performance too, with Motorola claiming it can manage up to 24 hours of talk time or 286 hours of standby time. If the battery lives up to its potential it could be the saving grace in an otherwise slightly underwhelming handset.